Today I want to talk about a particular dog. The watchdog – according to wikipedia – is an electronic timer that is used to detect and recover from computer malfunctions. Yep! The watchdog, normally, is used to reset the microcontroller when it stuck in a part of the program for many reason. When we enable the watchdog, during normal operation, we need to reset it. Otherwise, when the microcontroller’s sketch – or firmware – is stucked in some point, we can’t reset the watchdog timer and the microcontroller will be reset. But watchdog timer can also be used like a timer that wakeup the microcontroller after a certain time, by using its interrupt. So we can put to sleep the microcontroller, save power energy, and then wake up the microcontroller with the watchdog set to certain time. If we use battery we can save a lot of power! If we are using a battery, when we turn off the LED and then we wait for 1 sec, we only waste energy. This because the LED is off and the microcontroller don’t do anything, it only wait and waste energy. When the micro is in active mode – while we wait and the LED is turned off – it consumes 300 uA. Otherwise, if we put in sleep the microcontroller – specifically in power-down mode – it only consumes 0.1 uA. So, instead of do nothing and keep the micro in active mode, we can put it in sleep and save a lot of energy! If the micro is in standby who wake up it? We need to push some buttons to fire an interrupt? No. We can use the watchdog timer interrupt to wake up the microcontroller after certain time! Well, we have created the function waitSleep() where we can indicate how many seconds we want to sleep. We are using this function instead of the delay() function. The waitSleep() function counts the number how seconds we want to sleep. This because the watchdog timer can be set in different timing. In this case we have set the watchdog to fire every 1 sec. After I explain how to set the watchdog. So, every second the waitSleep() function call the goSleep() function that set the watchdog, disable all the unnecessary peripherals an go to sleep(). When the watchdog timer interrupt wake up the microcontroller, the code continues after the sleep_mode() function, disable the watchdog and re-enable all the peripherals. If the microcontroller goes to sleep for the seconds that we have set, the code return to turn ON the LED. Well, but how we set the watchdog and, more important, how we set its timer value? We need to read the Datasheet. So, take a look of the Attiny84’s datasheet. The MCU Status register – aka MCUSR – and the Watchdog timer control and status register – aka WDTCSR. First, in the MCUSR register, we need to reset the WDRF bit that is the flag of the watchdog interrupt. Every time we have a watchdog interrupt, this bit is set to 1 by the microcontroller. So we need to clear it to make the interrupt works again. 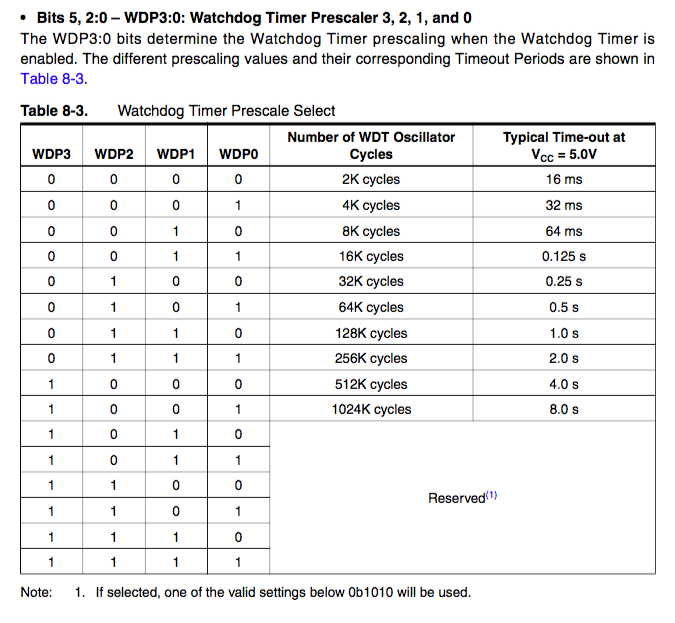 After, in the WDTCSR register, we set the WDCE bit that is the watchdog change enable to clear the WD timer and also permits to change the prescaler value. Next we set the WDE bit to enable the WD. Now we can set the value of the WD prescaler according to its table. In our case we set the prescaler to 1 sec by set the WPD2 and WPD1 bits. Finally we set the WDIE bit that enables the watchdog interrupt instead of the reset of the microcontroller. Remember to add the ISR(WDT_vect) function to your sketch. This because the microcontroller wants it to use the WD interrupt. Well, know we can use WD to save energy. I’ve used this hack in KeyChainino. 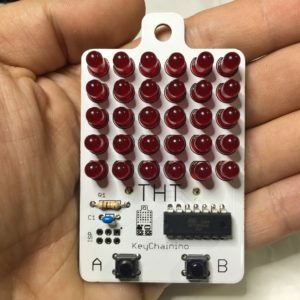 I’ve made a simple KeyChainino Christmas Lamp to hang up on your Christmas Tree. 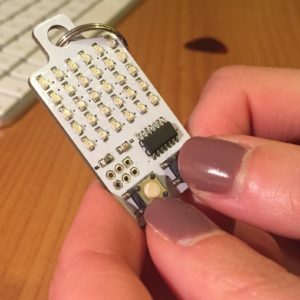 ← Arduino LEDs shield? No Thanks!